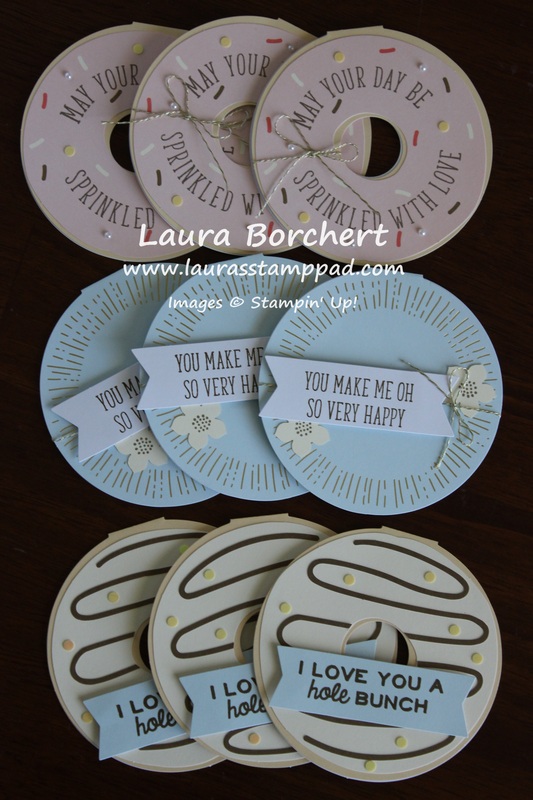 May 2017 Paper Pumpkin – Sprinkled With Love!!! 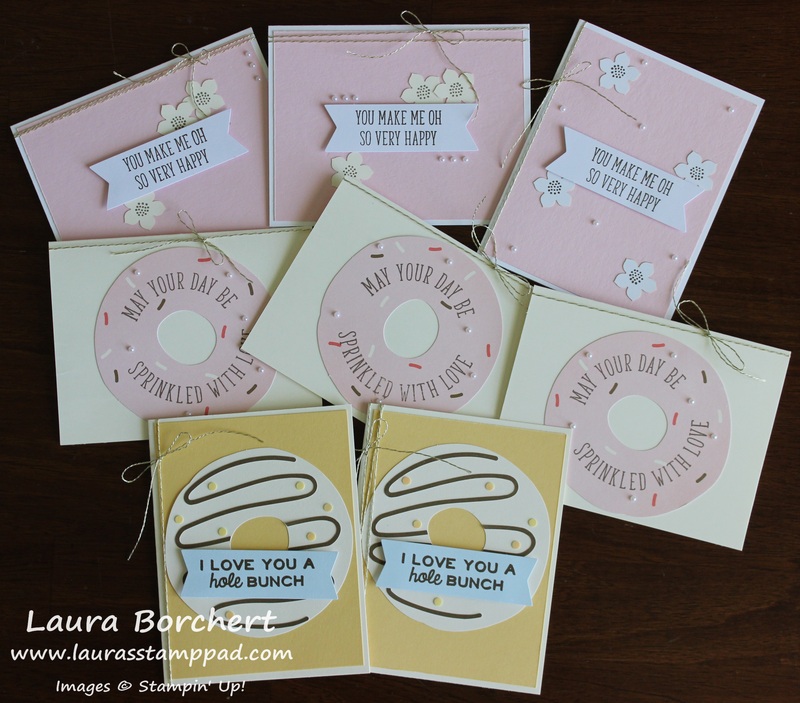 The May 2017 Paper Pumpkin Kit, Sprinkled With Love, is super cute and fun with it’s donut theme! 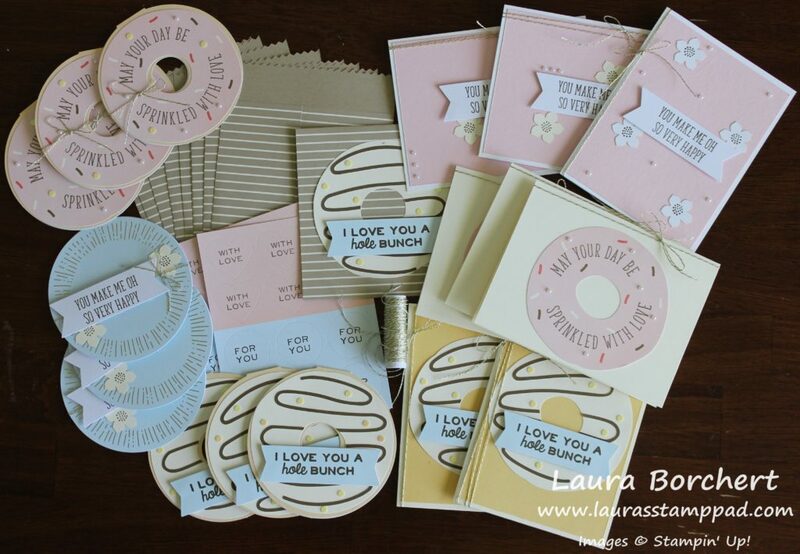 I was able to make so many cards with this kit and all the leftovers. I love that about these kits. There is always so much product in each one!!! Sign up now with the Promo Code: STARTHERE and you can get June, July, & August at 25% off which makes it even more fabulous! Click here to get signed up! LOOK AT ALL OF THESE!!!! 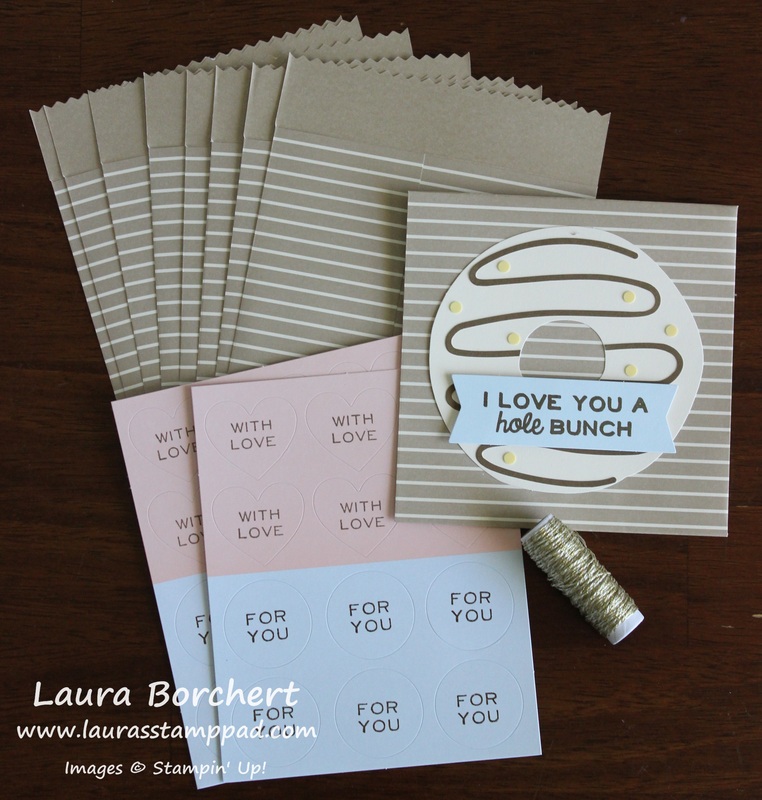 I created 17 Cards and 9 Treat Bags with this kit!!! It technically states that it makes 9 cards and 9 treat bags but with all of the leftovers, I added a little bit of my own cardstock to create even more!!! Let’s look at it all! I stamped all of the little greeting stickers so they will be ready when I am! The treat bags are the perfect size for a little something sweet and even have a nice score line to fold the top flap over! The gold twine adds a little extra bling to the treat! I did put one of the extra donuts on a treat bag for decoration. I thought this would be perfect to drop a Starbucks Gift Card into as a gift. Super cute and great to have on hand for a hostess gift or pick-me-up gift! I just love it! These are all of the extra cards I created with the leftovers. I used Very Vanilla and Whisper White for my card bases. I added in some Pink Pirouette and So Saffron for a little bit of color! Then I just added the leftover pieces and tied some of the Gold Twine around it. I have 1 pearl and more twine to use on the treat bags left over. Oh, you can’t forget the Soft Suede Ink Pad and fabulous stamp set too! Do you all love Paper Pumpkin as much as me??? You can see the unboxing and reveal of this kit here. My favorite part is the surprise of it each month. I also love that it is all wrapped up like a present. After all, we all deserve a present each month, don’t we?!?!?! If you haven’t tried out Paper Pumpkin, what are you waiting for????? Sign up now with the Promo Code: STARTHERE and you can get the June, July, & August Kits at 25% off which makes it even more fabulous! That makes it like $15 for stamps, ink, a clear block, and all the goodies!!! Click here to get signed up today! « Top 5 Blog Posts From the 2016-2017 Catalog!! !